Through volunteer work and non-profit structure, 25+ small food enterprises have been advised, coached and helped to obtain peer to peer loans. Slow Money SLO contributes to the well-being of the SLO County food system, farms and residents. Our vision, mission and goals here. Monday April 22, 5-7 pm, 2494 Victoria Avenue, at Caudill, just off Broad St.
See the latest remodeling at the Co-op, Grab and Go food, and sample the latest food products in stock. Slow Money SLO celebrates the Co-op success as the first community lending package facilitated by Slow Money SLO. Sample food from the latest Co-op suppliers and bring your reusable containers for bulk food and soup while catching up with the most recent Slow Money SLO happenings. No membership required for Co-op shopping! We are pleased to announce Marco Vangelisti from the Slow Money Bay Area group will be back in town in May. Some of you who have been involved since the early days will remember him speaking at our Gather in the Grove event. Marco speaks across the country on the banking system, understanding really where your money is going and how to make good investment decisions and making sure they are aligned with your values! This is a great way to learn why the Slow Money style of investing is an important part of your financial planning. This is not a sales pitch or trying to sell you something. Marco is an engaging speaker! The small farms and local food entrepreneurs of SLO County and Northern Santa Barbara County have been the focus of our mission since 2012. But over the course of 2018, it became clear that we needed more specific attention to the farming community. We were determined to raise the effort and focus on small farms, in recognition of their importance to the local food system as well as their extensive challenges to success and growth. FarmSLO is a program of Slow Money SLO with a volunteer leadership team of local, small farmers. Activities and projects will be developed over time with focus on addressing shared farmer issues. A Google group exclusively for farmers has been created for farmer to farmer communication and more than 50 of them have already joined. If you are a farmer or know one who should be involved, click here for more details. We are thankful to the Community Foundation of SLO County for awarding us a $2,500 BUILD grant to help with program components. Slow Money SLO staff and operations budget will also be used for the work ahead. Please Click Here if you would like to support this program. See the March issue of Central Coast Journal and read more about our plans! Read the online version HERE. Go to page 28 in the hardcopy or page 15 in the online viewer application. The weather could not have been more perfect. The sell out crowd of about 85 were easily handled by the staff, with wine, kombucha, iced tea and great appetizers to kick things off. The SLO Natural Foods Co-op had a table talking about National Co-op month and giving out coupons for the store. The Co-op was the first food enterprise that Slow Money SLO assisted and they are going strong 6 years later! Farmers and all food purveyors who contributed to the great menu were given special badges to identify them, allowing guests to mingle and learn more about their products in advance of the meal. Slow Money SLO messaging and stories were posted around the event to bring fans up to date on our work over the past 6 years. In a nutshell, loans have assisted 25 food entities, through 125 collective loans by 50 individuals. After dinner, three Slow Money SLO loan recipients spoke, conveying the impact they have seen as a result of our assistance. Aimee from the Co-op, Caroline from All Good and Jake from Whalebird each spoke for a few minutes. 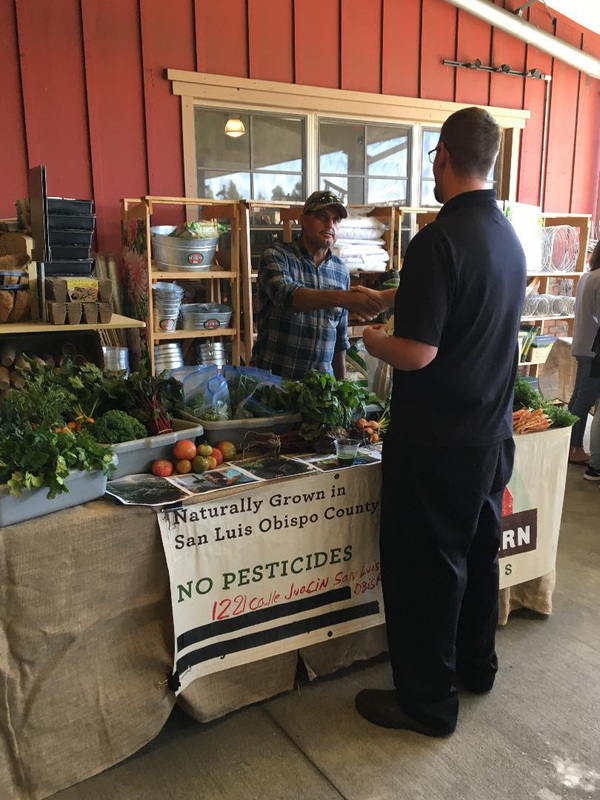 Then Mike Murgatroyd, Slow Money SLO Board President, spoke about what it means to him and his wife Caroline, to make a loan that helps the local food system. Guests were slow to leave, chatting and catching up, while the ever gracious Niner staff accommodated everyone with the most care you could imagine. YOU CAN SUPPORT LOCAL SIMPLY BY BUYING FROM THESE VENDORS WHEN YOU SEE THEM IN STORES OR FARMERS MARKETS. Beverages: Whalebird Kombucha and Niner Wine!!! Chef Chris Closser and Event Coordinator Andrew May did a magnificent job and the menu was incredible. Everyone loved it! We are incredibly grateful to Pam Niner, Andy Niner and the Niner family team for not only hosting the event but showing support and enthusiasm for our work throughout SLO County. Niner Wine is 100% estate grown grapes with sustainable management of their facilities and vineyards and with an award winning restaurant. Their tasting room is even LEED Silver certified. READ MORE about Mary Lou Wilhelm – Many Thanks to Mary Lou for her Vision and Support! Please help fund our 2019 Operations, FarmSLO Program and Lending to Small Farms and Food Purveyors. $10K Match Donation Challenge – Click Here! We will raise $20,000 with contributions totaling $10,000! Our Most recent event at Back Porch Bakery, thanks to all who attended! The first Slow Money Spotlight On-Site Gathering @ the Whalebird Kombucha Brewery was a huge success! Guests got to sip kombucha straight from the source while taking a tour of the rapidly growing Whalebird operation. 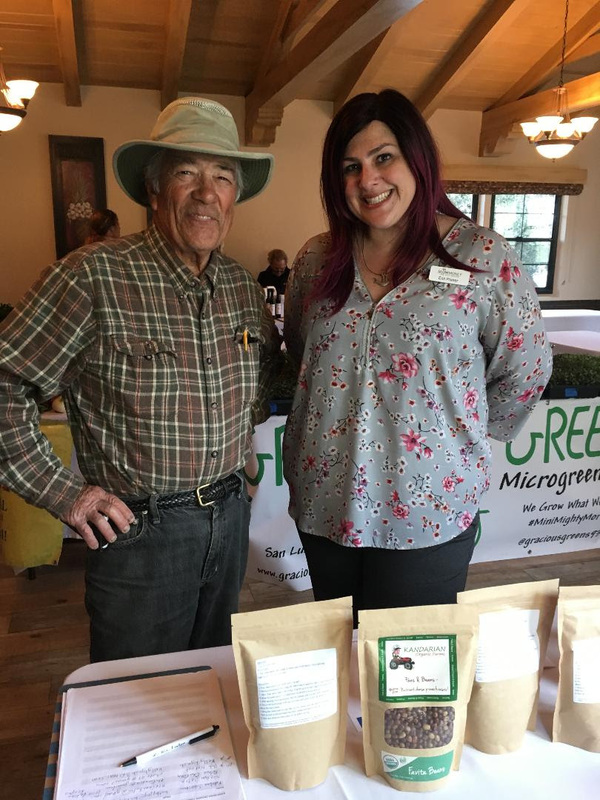 Guests also got to meet, greet and sample products from other emerging local food and farm businesses such as Atsa Foods, Bliss River Organics, Bloom Microgreens, Grateful Ghee, Monkey Spit Hot Sauce, and Moon Phase Farmers. A BIG THANK YOU to Whalebird Kombucha and the other (previously mentioned) vendors for their participation and contribution to the generous door prize; and also thank you to our guests for coming and supporting SLO County’s wonderful food and farm enterprises. Check back soon for more upcoming Slow Money SLO events! We started a new type of event providing an opportunity to socialize with like-minded food system advocates and fans of Slow Money SLO, we call it a SOCIAL. Our first such event was held at Bang the Drum brewery in SLO on March 6. Many thanks to the volunteer events team including new 2018 members! Our group quickly took over the place on this otherwise quiet winter Tuesday night. The Taco truck was there for dinner or a quick bite and the local, craft brew was tasty in a variety of styles. 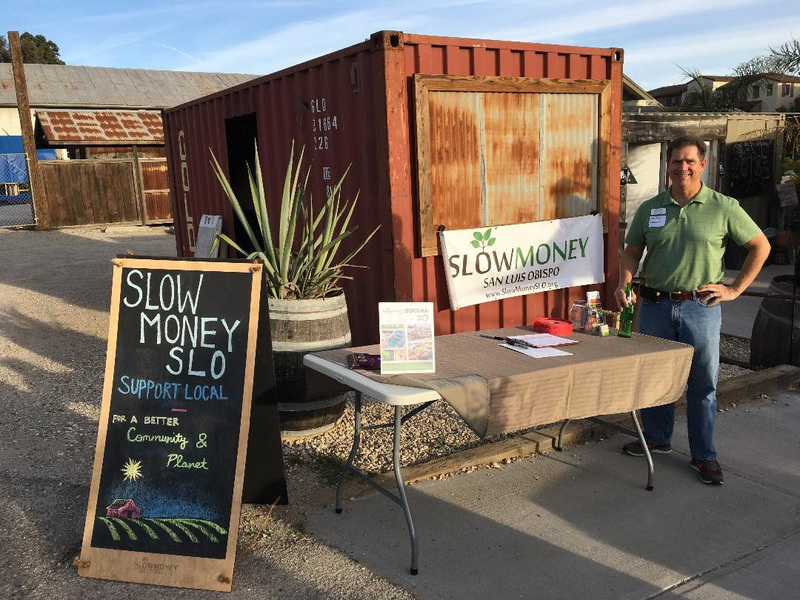 In addition to folks meeting each other for the first time and renewing friendships from past Gatherings, Jeff provided a quick update on Slow Money SLO activities and a short briefing for those not familiar with what we do. Other Bang the Drum patrons not aware of our event also participated and a few signed up for our mailing list. Building on 2017 success, we decided to repeat our Farm to Buyer mixer program. This would not have been possible without the great support of Board member Erin Primer and her interns. In particular, Reni from Denmark, a full time intern for the months of February and March was an incredible resource. On March 6, Farm Supply SLO again offered their facility for our program, and we must thank them again for allowing us to use such a great venue. About 20 farmers set up tables and were ready to meet local chefs, restaurant owners, wineries, food distributors, grocers and school system food service directors. These were personally invited by Slow Money SLO as the event was not open to the public. We did a similar program again, one week later at the Paso Robles Inn who furnished space at their non-profit rate. It was a great way to reach the North County institutional and commercial buyers. Creating this opportunity for farmers and buyers to meet tends to reduce or eliminate some of the barriers to commerce between buyers and small farms. The relationships created help to make things happen when the prospect of offering great, local produce to customers is the result. Many of these farmers may not be selling at Farmers Markets or may only sell at one or two markets that may not be convenient for a buyer to attend. Has anyone ever heard of the great organic blueberries being grown near Lake Nacimiento? Many great connections were made and the results should start showing up on your plate the next time you dine at a restaurant buying local. Don’t forget to ask them what is local on the menu! Also, the kids in many SLO County school districts are seeing more local food in their school lunch program. Just ask Erin, who runs the San Luis Coastal Food Services, and who champions local buying to her peers every day. Fall Gathering and Celebration of Five Years! Our celebration of local restaurants was extremely well attended! The food was incredible and we heard from each of the sampling restaurants about their holiday specials, and plans for 2018. We thank and appreciate Mint+Craft (a Novo group restaurant), Back Porch Bakery, Lincoln Deli, Bliss Café, Doc Burnstein’s and the SLO Natural Foods grocery. Plus Niner Estates and Whalebird Kombucha for donating drink to go along with the food. A wonderful feature article by Hayley Thomas Cain in the New Times on the Thursday before was a big boost and an article by Camas Frank in the SLO City News a week prior to that kicked off the exposure. Also, Marissa Nall at the Pacific Coast Business Times wrote a wonderful recap a week after the event. We are very thankful for the exposure and just the realization that what we are doing is newsworthy and making a difference. Many thanks to our Program team volunteers for the great planning and execution, as well as the Facebook work to promote the event. And, thanks to our non-profit partners who always help with announcing our events. See these and their links on our website page. STAY TUNED FOR ANNOUNCEMENTS ABOUT OUR NEXT EVENT! Sign up for our Newsletter HERE. ALSO, Please consider helping with our $10,000 fundraising campaign. When we reach that figure, hopefully before the end of March, we will receive a matching $10,000. Many thanks to those who have already donated. Many thanks to all who joined us. The snipets from Woody’s new book were fun and meaningful. For example, “I’m Sad as Hell, and I’m not going to Fake it Anymore!” Tom Neuhaus and the history of Mama Ganache was both engaging and interesting. And, of course, the Novo brunch was fantastic. Many new friends were made amongst each other and Slow Money SLO now has a few new fans as well! For a refreshing change of scenery and long overdue visit to North County SLO, we decided to host our Spring Gathering at Oak Creek Commons in Paso Robles. It was a great success given the number of local businesses and new faces that gathered. Click here for a full recap and to see what you missed! Report on 2016 – Thank you, it was a great year! During 2016, Slow Money SLO experienced incredible growth in awareness and enthusiasm for our mission, vision and programs. We achieved great results and grew in some ways that were unanticipated! The number of involved volunteers, investors, donors, advisers and advocates all increased dramatically. Many thanks go out to the individuals and strategic partners who have generously contributed their time, knowledge, capital and passion to support the growth of small food enterprises and Slow Money SLO. Click here for the entire 2016 Report. Woody Tasch, returned to SLO County October 6-8, 2016, after inspiring us to get a local group off the ground in 2012. It a great reunion, a great celebration of our work supporting small food enterprises and an education on the importance of Slow Money, which only Woody can really convey! Woody was thrilled to see the fruits of our efforts and thoroughly enjoyed all the discussions he had with local entrepreneurs, lenders, donors and those involved with supporting SLO County businesses and non-profits. We have truly embraced and delivered on the Slow Money Principles and our version of implementing Nuture Capital (somewhere in between Philanthropy and Investing) will return with Woody to Boulder as further motivation for the national movement. The national movement springs from allowing local groups to start and evolve according to the needs of the region and addressing the opportunities that best serve the local food system. Our events reflected the variety and richness of the work accomplished over the past four years. Woody speaks to a group of ambitious college students. We convened more than 125 students at Cal Poly during their Thursday UU Hour in the Chumash auditorium. Since hearing from Woody and myself, I have had numerous students reach out asking to stay connected and volunteer. One is writing a class paper on our efforts and another group is going to perform a research project to help quantify the value to some of our entrepreneurs. Thursday night at the SLO Guild was a lot of fun. Our panel of Rob from South Bay Wild, Cecilia from Baba Small Batch and Larry from Kandarian Organic Farms were excellent. Each one told their story of effort, discovery and growth as a local food business. They were inspiring stories and Woody Tasch capped the night by providing the National view on why we are doing this work, and the importance of local, community attention to the soil, our food system and investing local. It is really at the core of building resilient communities and relationships. About 65 attended and local food was enjoyed from Vert Foods, Julia’s Juices, Root Beer from Sunshine Bottle Works and TreatSLO. After a couple of days of meet and greet sessions, we capped the week with our Local Food Celebration at Niner Estate Wines. Local food donated by so many incredible artisan food purveyors gave the Niner kitchen a great palette to produce excellent dishes that were complemented by their wine, White, Rose and Red. The Niner team was an incredible and generous partner in this event and we cannot thank them enough. Andy Niner has a great team, and it is easy to see why. His management and how they communicate between each other is a great example of how to run a customer focused business. In our case, we were the non-profit beneficiaries of their support for sustainability. Andy told the story about his father getting his early business off the ground with a small personal loan and he was thrilled that we are helping local small food businesses in the same way. Woody, as always, was inspiring, painting the big picture, while making it relevant to everyone local. Woody gave those already involved a deeper perspective of why it is important, and helped those new to Slow Money to see their way to becoming more involved. Many new faces were among the 80+ attending and I feel that it has set a wonderful foundation for our work in the coming year. Whether you saw Woody or not at the recent events you should take a moment and read his essay at the link below. It helps position why our work is so important and may encourage you to become involved or more engaged as a lender, volunteer or donor to Slow Money SLO. This essay will appear in the next issue of the Slow Money Journal. Woody has given us an advance view, in way of thanks for your efforts towards Slow Money SLO and local, small food enterprises. The support and participation by friends, associates and food entrepreneurs over the three days of Woody was awesome and I didn’t want the Niner event to end. However, when it did, I felt the satisfaction that everyone had a wonderful time, but more importantly, I could see the depth of alliance with the Slow Money Principles by everyone there. Thanks again to Hunter and Claire for their support and for wrapping these events into their first Sustainable Ag Lecture series for 2016-17. 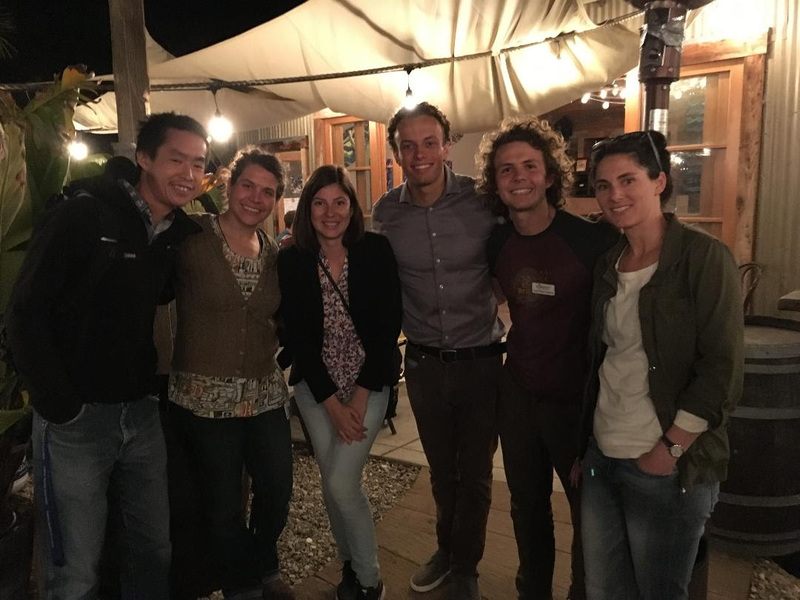 The Center for Sustainability continued the relationship which began when Woody spoke at their fundraising event in 2012, which inspired our local group to form and lend to the SLO Natural Foods Co-op. Many thanks to all, especially the Slow Money SLO Programs team, Kylie, Danielle, Cecilia and Adam. Your commitment was fantastic and execution, even better. I look forward to bringing a few of our new volunteers to the table to help you out with our future meetings and events! Finally, we can’t thank our food entrepreneurs (below) enough for providing the incredible local flavor to these events. As always, if you have not already done so, please go to the National Slow Money website and consider signing the Principles (no cost or commitment to do this) to show your support and to receive their periodic updates of everything happening around the country. Check out our new Kiva Zip Trustee Lending here.